Ever ridden a giant rabbit? If not, families must make a stop along the open road at Wall Drug. So much more than a drug store, it offers many activities. Founded on the simple gift of free ice water, Wall Drug is said to draw up to 20,000 people on a hot summer day. Today, it still offers water, while selling toys, candy and other one-of-a-kind souvenirs. The complex consists of a drug store, gift shop, restaurant and other stores, all operating as a single entity. Giant rabbit and dinosaur sculptures guard the building, which has an old-timey, cowboy charm. 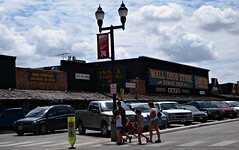 Wall Drug is certainly a stop worth making, if only to pick up a glass of cold water on a hot car ride. 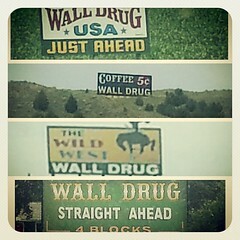 Look out for many Wall Drug signs along the highway! These signs are both comical and useful, guiding drivers to Wall Drug.